For brides who want to flouce and twirl, the spirited ruffled layers of Style 2308 Paloma will no doubt satisfy, as they cascade down the ballgown skirt of this dress in a magical way. 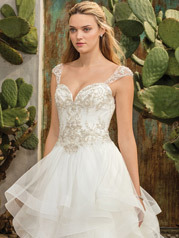 Up top, a beaded deep sweetheart neckline bodice with a basque waist provides sparkle. With an illusion back and cap sleeves, Paloma is truly a gown for the bride who wants it all.